You would think picking refrigerators should be simple because they are designed to fit inside cabinets. The most common sizes for refrigerators are 36, 33 and 30-inch widths. There are plenty of choices in 36 inches of every configuration from column (all refrigerator or all freezer), professional, integrated, and regular counter depth refrigerators. From there, it becomes difficult to find a selection.  For instance, in 33-inches, you have only 3 brands who make them. Samsung, Fisher & Paykel, and an Electrolux all refrigerator column. Your selection is better for a 30-inch counter depth, but only if you are looking for a premium refrigerator. You do not have a Samsung-type $1,299 French door option like a 33-inch size. In this article, you will learn the best 30-inch counter depth brands and differences. First, let's look at a few similarities. Thirty-inch brands feature twin compressors, so the air is distributed more evenly. It also eliminates the drier air of the freezer being cycled to the refrigerator and the moister air of the refrigerator being sent to the freezer. There are only premium brands currently manufacturing 30-inch counter depth refrigerators (I am not including columns which are just all refrigerator or freezer): Sub-Zero, Thermador, Liebherr, Bosch, and Miele. Viking and GE Monogram also have a few models. The new IT-30CIID $7,199 paneled $8,459 stainless steel. Sub-Zero is the best known and probably best-built refrigerator and is manufactured in the U.S.
Sub-Zero is the only refrigerator with an air scrubber to "scrub" the gasses of foods in the refrigerator, so food stays fresher for a longer time. They also have an advanced water purifier. The IT-30CIID has an interior water dispenser and 2 freezer drawers. When paneled the fridge integrates flush into your cabinets. If you are looking for a "Pro" type with the compressors on the top, they manufacture the BI-30. It has the commercial look, but the door and handles will protrude. Sub-Zero has a better seal on the door and crispers to keep air out and food fresher longer. Thermador, Miele, and Bosch are all manufactured in the same factory with slightly different specifications. Like the Sub-Zero IT-30CIID they can install flush into the cabinets creating that integrated look. The door (not the body) of Sub-Zero BI-30U and other traditional counter depths will stick out another 3-4 inches. 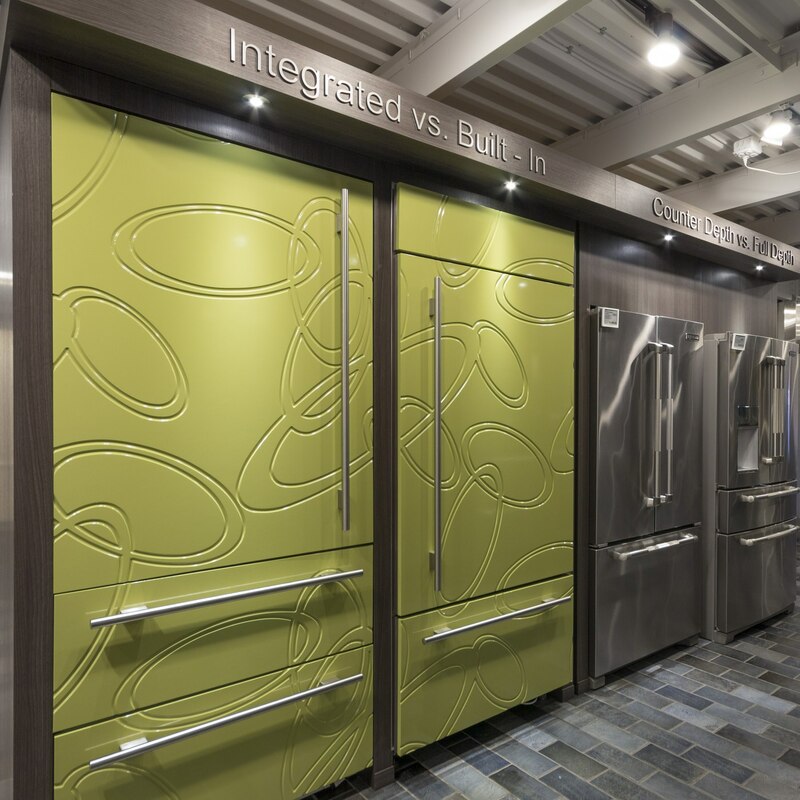 Thermador has just redesigned their integrated "Freedom" refrigerators. There are a couple of interesting features. You have a push to open door, so you can open the door with your hands full. The bins are customizable to different types of items. The cold air from the compressor is blown directly into the door to keep items colder. Bosch and Miele are produced in the same factory as Thermador but offer different features plus both have rebates on kitchen purchases. In case of Bosch, it is just about price. For Miele, they have the MasterChef crisper drawers to keep fruit and veggies fresh. $7,395 with panels and $7,895 in stainless. Miele has the same body as Bosch and Thermador, but offers much better lighting and electronic crispers. The electronic crispers allow you to choose the exact temperature. This feature is designed to keep fruits and vegetables fresher. Miele also offers a wifi hook up and can monitor the refrigerator for service (pretty cool or somewhat creepy depending). Liebherr CS-1660 $4,399 and HCB1560 $5,879 and $6,529 in stainless. Liebherr is another high-quality German company. They actually supply Miele for products in Europe. They offer the least expensive 24-inch option at $3,999. 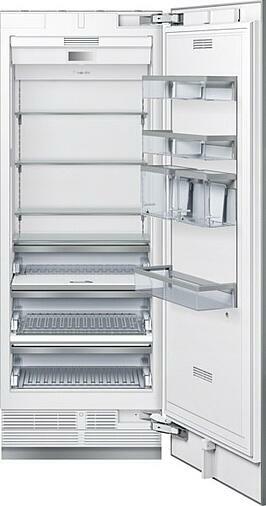 They also offer a taller, more pro-looking refrigerator with double freezer drawers at a higher price. The neat feature to Liebherr is their bio fresh drawer preserving fruit and veggies longer. Liebherr is tough to service and requires more than other German products. Consider that if you are not from the Boston area (we are a factory service agent for Liebherr). Sub-Zero, Thermador, Bosch, and Liebherr are all great names. You have plenty of choices for a premium refrigerator. If you are a bit shocked about the prices, you have a few options. For new kitchens, buy an 18-inch dishwasher instead of the regular 24-inch size, because you do not lose much in space and features. If you value a refrigerator over a stove, you can always buy a 24-inch range. 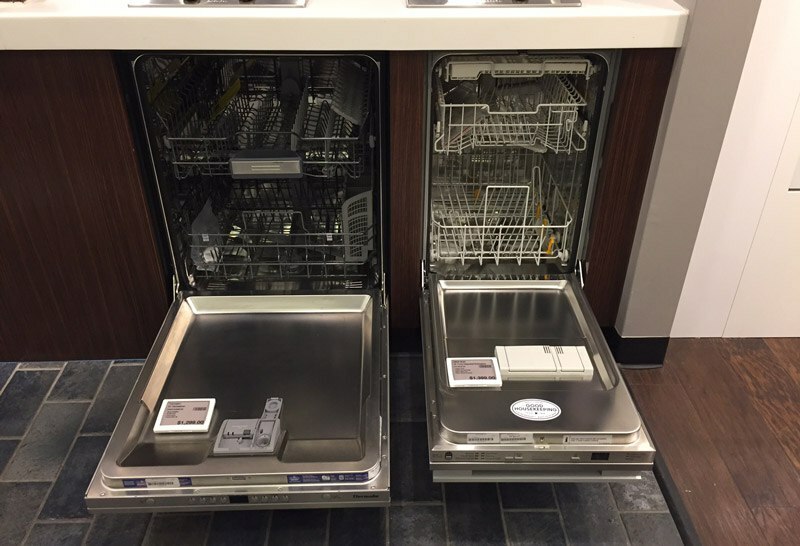 Dishwashers are better to decrease in size because you lose less and still have a great selection. If you can shave 6 inches from your plan, buy a 36-inch counter depth for about $1500-2500. Samsung has a great counter depth refrigerator at $1,199 for a 33-inch space. Again, for premium products, 30 inches is a great size. However, for a more affordable size, you will have to consider a 33 or 36-inch size. 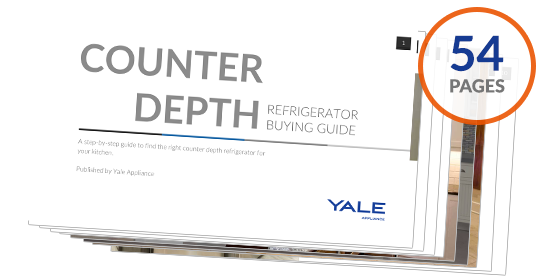 Download the Yale Counter Depth Refrigerators Buying Guide with features, specs and inside tips to every counter depth refrigerator. Over 310,000 people have read a Yale Guide.